Discover two of the most beautiful places in the Middle East : Petra and Wadi Rum desert. This 3 day tour will suit the traveler with a short time in Jordan who wants discover the major sites of Petra and Wadi Rum. Departure from any airport, border or hotel, we will guide you on your exploration of the majestic Petra, accompanied by an experienced cultural guide. We also offer a full day to discover Wadi Rum and its Bedouin traditions, or you can choose from our suggested programs. Pick up from any border, airport or hotel in Jordan. We will drive you to the magnificent Petra, the new seventh wonder of the world. You will spend the full day walking in this impressive city built by the Nabataeans, and you will enjoy the services of a cultural guide for 3 hours, with additional free time to explore the site according to your own preferences. Overnight in our selection of hotels by the entrance to the site. Early departure for Wadi Rum. After a first Bedouin tea with our team, you will have the opportunity to appreciate the amazing desert landscape. You will have the choice of our different selection of programmes: Bedouin Day (Jeep&Walk safari) or Discovery Day (Camel-Walk&Jeep). 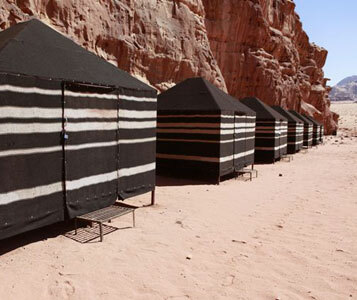 Evening and overnight in our Bedouin camp, where your private tent will be surrounded by 1,000 stars. Transfer back to any border, airport or hotel to pursue your route. Hotel accommodation on BB basis. Transfers in private, a/c , car/ minivan with English speaking tour leader.